Today’s post comes from a recent experience we had as we were rebuilding one of our servers. 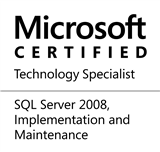 We were building the server from scratch and had just deployed SQL Server 2012 with SP1. As we were installing our application on the server, the installation failed with an error that another installer was running in parallel (which did not appear to be the case since the server was restarted before the installation began). The hunt started for the infrastructure team who had originally built the server and installed SQL Server. Although they did find the CPU spiking to 100% occasionally during the post-install configuration, none of them could recall anything unusual during the installation. This entry was posted in #SQLServer, Blog, Imported from BeyondRelational and tagged #SQLServer on February 25, 2013 by nakulvachhrajani.